This holiday season I decided to resurrect a little festive get-together I used to host every December right before the holidays just for friends. For the previous two Christmases, I didn't have the space to host a party... at all. I try to keep these get-togethers small. A couple of girlfriends and their families. I made some super simple stirrers for the hot cocoa. I broke the hooks off the candy canes (well, actually most of them were already broke at the hook :p). I then heated a 1/2 cup of semi sweet chocolate chips and 2 teaspoons of shortening in a small saucepan over medium heat until smooth. I rolled the end of each of the candy canes in the melted chocolate & let them set up on a baking sheet covered with parchment paper for about 2 minutes. Then I sprinkled them with some fun holiday sprinkles. Let them harden completely before arranging them in a small mason jar. Don't toss those candy cane hooks! Put them in a food storage bag and crush them with a meat pounder or rolling pin. You can pour the crushed candy canes into another small mason jar so your guests can add them to their mug of cocoa for a quick peppermint hot chocolate. I put together these cute pine and cranberry arrangements in just a few minutes. We had pine boughs left that we had cut off from the bottom of our Christmas tree. I snipped off some clippings from a few of these. I then filled leftover pasta jars that I had cleaned & removed the labels from about 2/3 of the way with water. I dropped in a couple of handfuls of fresh cranberries into each jar, arranged the pine snippings, and then tied a large festive bow around the top of each of the jars. 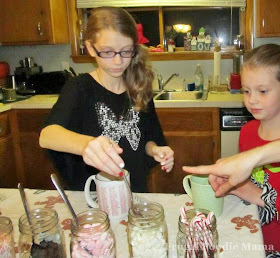 My guests had 5 yummy options to choose from at the hot cocoa bar- the chocolate covered candy cane stirrers I made earlier, plain mini marshmallows, peppermint mini marshmallows, crushed Oreo's (cookies 'n cream), crushed peppermint, and there was whipped topping as well. Just dump it all in the Crock Pot, whisk it together, and turn the Crock Pot onto High. Whisk everything every 30 minutes or so as the chocolate tablets melt. After an hour and half, taste the hot chocolate and add milk or more chocolate to taste. 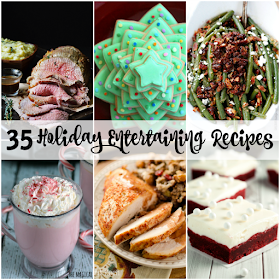 Are you hosting a holiday get-together for friends this holiday season? What are your tips for keeping the party fuss free and fun for everyone (including the hostess!)? I LOVE this idea!! 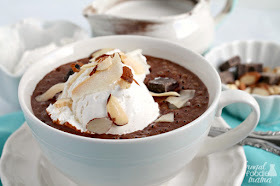 I was actually thinking about having a hot chocolate party after Christmas and I love your ideas for toppings! Hope you have a Merry Christmas. This is so fun! Such a great idea! The cocoa was great and the company was even better! Thanks for having us over for your party. I think you are missing some pics on here though, you needed some of Arryn in a chocolate coma and Lincoln redecorating your kitchen ;) Have a great Christmas and we will see you soon! This idea is so so cute! We're having a xmas party this weekend and I wanted to do something similar--I love the idea of throwing the cocoa in a crockpot! Genius! 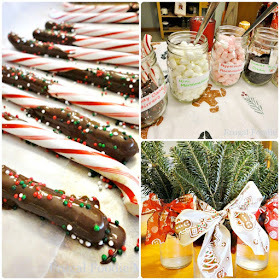 I've had a candy bar for Christmas parties this year, but I love this idea! 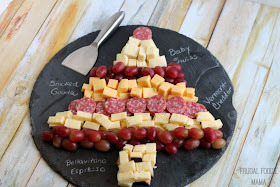 What a wonderful, fun and festive idea for a great party! What a cute party idea! the peppermint mocha bunt cake also sounds pretty amazing! Loved seeing this at the special link party supporting Sandy Hook last week. Hope you'll come to The Humble Brag link party today to see some features from last week and link up some more cool projects. We also give away FREE AD SPACE every week! Happy Friday! I made your hot cocoa recipe for my traditional seasonal Hot Cocoa night and it was a hit! I made it on the stovetop and the chocolate melt quickly and the milk didn't burned. After ready, I tranferred the hot cocoa to several thermal carafes (yes, I made severbatches!) because I don't have a big enough crock-pot. But the carafes kept it warm throughout the party. Also, I made the candy cane stirrers and everybody loved them! Thanks for sharing your ideas!